Many of the best NYC parks offer amazing things to do outside, including programs that run the gamut from movies under the stars to free alfresco fitness classes. 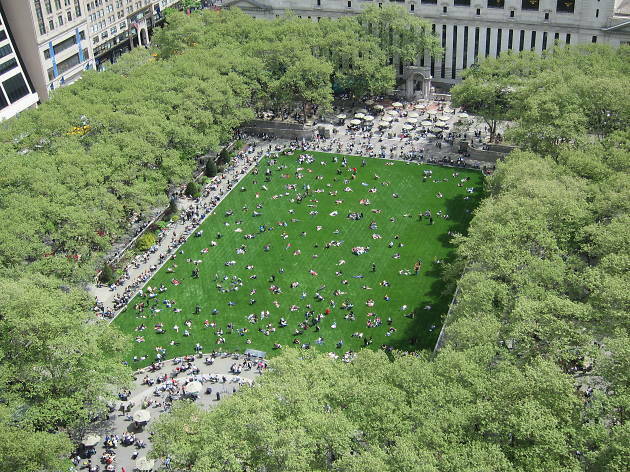 But Bryant Park surely raises the bar in terms of open-air entertainment. Once the lush and gorgeous lawn opens for the season (May 2017), the midtown green space becomes the perfect warm-weather hangout, where you can enjoy a picnic, take a Tai Chi class, learn about Beekeeping and more. Until then, take advantage of the fun (and free!) activities you can do at the park right now! Get creative and show off your artistic talents with free drawing and craft supplies. Members of La Boule New Yorkaise will teach you how to play this popular European game. Get your paddle ready! Gather your friends and challenge park-goers to a riveting game of ping pong. Can you say Yahtzee? With over 50 tabletop board games to choose from, you and a friend can relive the glory days of Scrabble, Jenga and more. Activities in the Reading Room include crosswords programs, Poem in Your Pocket Day, BookClub, StoryTime, Writer Workshops, Reel Talks and more. Also known as Viking Chess, learn how to play this popular Scandinavian lawn game. Don't forget to yell, "Fore!" Comedians usually host this round of Bingo with music provided by a DJ. The park is making it even easier for you to have a romantic picnic with bae (or friends!) by providing free blankets and lawn games as well as food and drink for purchase. 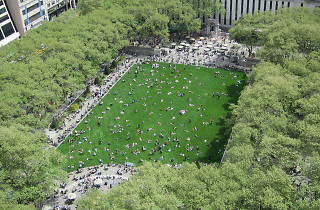 There will also be live theater, dance or music performances to entertain you while you lounge on the grass. Taste local-made honey while learning about the lives New York honeybees. Forget Whole Foods—pick up delicious produce, artisan bread, cheese and fresh-cut flowers at the park! Clown around and learn a new party trick! En garde! Masters from the Manhattan Fencing Center will teach you the basics of the sport before you duel. Beginners are welcome to learn Brazilian Portuguese, Japanese and Italian at these one-off classes presented by inlingua. Want to become a knit wiz? Learn how to make a scarf just in time for winter with folks from Knitty City. The Rise NYC will surely raise your heart rate with this blend of cardio and strength training. This class, instructed by members of the Tai Chi Chuan Center under the direction of Jeremy Hubbell, will get you focused and in the zone for your work day. Find your inner zen thanks to Athleta and instructors curated by Yoga Journal. Shake your rump and learn how to move with dancers from the world-renowned Limon Dance Company. Relax and de-stress before a big work day with this soothing walk around the park, led by a meditation guide. This is a free weekly outdoor concert, presented by the radio station 106.7 Lite fm. It features performances by cast members from current and upcoming Broadway and Off Broadway musicals. Get your swing on during a toe-tapping numbers that will have you singing along to ragtime, stride, tin-pan and jazz by local artists.